Now that I’ve completed it, I can’t avoid saying something about just how much of an impact Portal has had on me. As I mentioned last week, it only took playing the first hour of the game to convince me that I had to finish it. But finishing it has convinced me that it’s truly one of the best games of the year, and that 2007 is turning out to be a renaissance in video game narrative. Portal and Bioshock are, in many ways, two perfect bookends of the same idea. They mix together narrative and gameplay in a way that forces a player to confront his limitations in the artificial world. You are a gimp who can only speak through the gun at the end of your arm, and the game actually uses that in a way that drives the narrative forwards. But these two games choose totally different paths. If both of them were a type of cake, Bioshock is a deep, dark chocolate, with layers and layers of icing. Portal comes off more as a lemony angel food. Light and tart. One truly unique that Valve’s tasty confection has going for it is that the gameplay isn’t centered around murder as a primary play dynamic. You do end up having to take out some enemies, but the gun at the end of your arm opens portals instead of firing bullets. That means that opponents have to be defeated through guile, and not by trying to get that all important head shot. 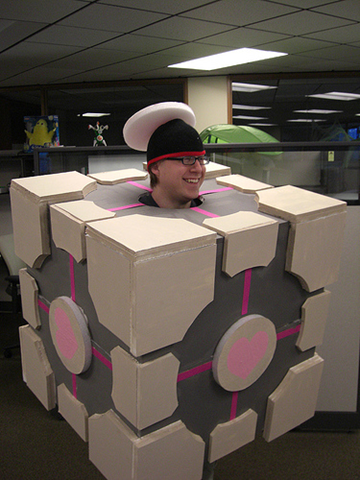 Another brilliant post-modern twist that Portal has is the Weighted Companion Cube. (Before going any further I’ll post a mild spoiler warning here.) The game created a loveable character with absolutely no innate personality at all. It’s literally the same as every other cube in the game except that it has hearts drawn on it. And yet by the end of the level where it’s introduced you’ve established an emotional bond that’s developed entirely through the in-game narrative. It’s stunning and so simply done that it almost seems to deconstruct itself when you think about it. I’ve spent the last few days just turning it over and over in my head, and I can’t get over the contrast between the object itself and the ability of the game to bring it to life. And if you don’t think it has been effective take a look at the response. 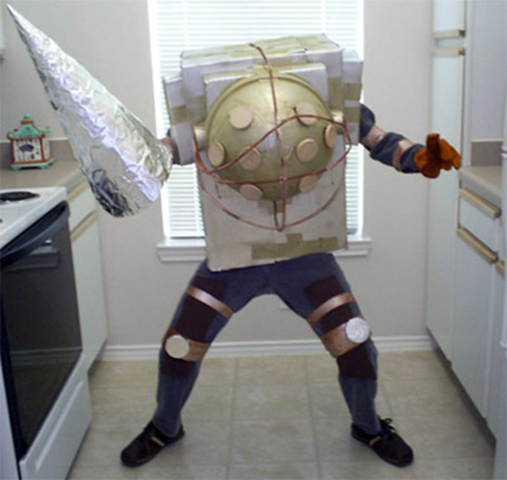 The Big Daddy in Bioshock is a character that’s very similar to the cube in many ways, from its inherent inhumanity to the the mixed emotions that come out of your interaction with it. But he’s brought to life in a more traditional and direct way. He’s layered and nuanced with animation, design, audio, and deep interaction. It’s fully developed in a way that Portal could never never even imagine. And yet somehow the Companion Cube hits all many of the same notes. It’s a three minute pop song versus the opera. And considering just how derivative and halting the development of video game narrative has been up until now, it’s amazing that we’re getting both in the same year., let alone within a few months of each other. Hopefully the fact that they’re both successful titles means that we’ll see other games attempt to build on these concepts, and really start telling stories that can only be expressed through games.